I've almost made up my mind - and here is my list of cook books. 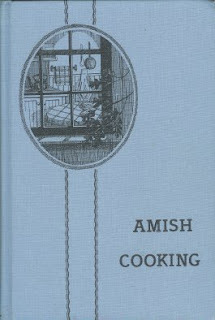 AMISH COOKING, the foreword tells us that the books recipes are taken from "Favorite Amish Family Recipes" and from the recipe page of Family Life. I treasure the book as it is a gift from my Amish friend Naomi. She has written comments in the book like: "we made quite a bit of this last winter", "this looks like our recipe - is a family favorite", "this is the bread recipe I use" or "remember this one?!". The last comment about a cake we made together once. SCHWEIZER KÜCHENSPEZIALITÄTEN, a Swiss old fashion cook book - no pictures and hardly any instructions. 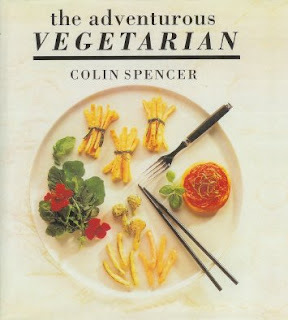 "the adventurous VEGETARIAN" by Colin Spencer. A British book I have had for quite a while but not tried any of the recipes. It has lovely water color illustrations as well as beautiful photos of the dishes. 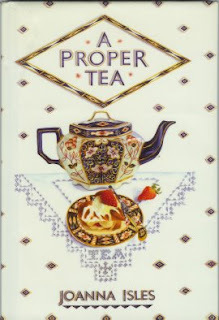 "A PROPER TEA" by Joanna Isles. Another beautiful books with water color illustrations by the author. 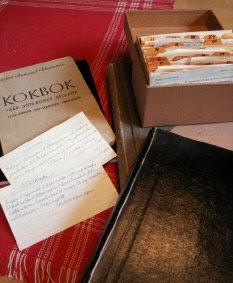 FASTER INGEBORGS ANTECKNINGSBOK - Aunt Ingeborg's notebook. Ingeborg was my mother's aunt born in 1878. She taught home economy in the beginning of the last century. I have her collection of recipes, several notebooks and index cards filled with recipes. This book I'll use here is a simple exercise book with black cover. I still have to make up my mind about the last book. I know that I want to review one of the many books from Project Gutenberg but can't decide which one. There are plenty of vegetarian books and as a vegetarian I find them all interesting if a bit boring so I might take one of the very old ones instead. I've also decided to start an English blog - something I've told my English speaking friends I'm never going to do... but I have a feeling that most of you would prefer English over Swedish.